I was writing in my journal about happiness. I’ve had some struggles with work and finances, having to move, people from my past and all the stress that can create; however, every day I pretty much wake up feeling HAPPY and GRATEFUL. That is the truth for me, and for you. I can love, nurture, support, encourage and guide you but I can’t give you happiness. Your husband, boyfriend or partner can’t give you happiness. Your children can’t give you happiness. Your car, your job, a new laptop, designer purse, stylish haircut or circle of friends can’t give you happiness. All those other things can compliment, enhance and improve your life, but they can not make you happy. It’s honouring who you are by listening to what you are being told on the inside: RESPECT YOUR INSTINCT. It’s being mindful of your emotions, seeking to UNDERSTAND your choices and make changes for things that don’t work for you. It’s expressing who you are whether it’s through dancing, wearing red lipstick or gardening. It’s treating yourself with LOVE and KINDNESS and not being so internally critical and mean. It’s making HEALTHY CHOICES for your body by exercising, eating fresh, unprocessed food and managing stress and anxiety. It’s surrounding yourself with POSITIVE, loving people and limiting negative, angry people. It’s expressing GRATITUDE for all the daily BLESSINGS in your life. It’s being OPEN, HONEST, and REAL with yourself and others. Happiness comes from within and can never be filled by another person. What power you give them if they are in charge of your happiness! No, please don’t give your power away, EMPOWER yourSELF by being the SOURCE of your inner happiness. Have you thought about what part of your life isn’t working for you? What relationships are draining your energy? Are you listening to your instinct or quietly choosing denial? Is your voice being heard or is someone else speaking for you? Do the choices you make empower you or erode your spirit? I understand those are difficult questions to answer but your happiness may lie in the unedited TRUTH and UNDERSTANDING of those questions. Sometimes happiness isn’t found through beauty…sometimes happiness is found in the gritty, raw, proverbial rock bottom when you are sitting with just yourSELF, a box of tissues beside you, feeling alone, exhausted and verbalizing in the empty room how terribly unhappy you are. Your voice echoes back. You know in your gut, something has to change. CHOOSE YOUR RIGHT TO HAPPINESS. UNDERSTAND YOU ARE NOT A VICTIM; YOU HAVE THE POWER TO CHANGE YOUR LIFE. MAKE THE DECISION TO CREATE CHANGE BY CHOOSING TO DO WHATEVER IT TAKES TO BE HAPPY ON THE INSIDE. REMEMBER: HAPPINESS IS A GIFT YOU GIVE YOURSELF; NO ONE CAN GIVE IT TO YOU. YOU HAVE CONTROL! PS. 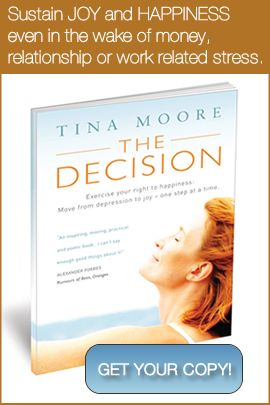 I am ready to launch my eBook called “The Decision”. It offers steps and guidance to FIND YOUR HAPPINESS. I share my personal experience of years of depression, anxiety and toxic relationships and how I turned that around to now sustaining lasting JOY. If I can do it, you can too! The book will be launched in just a few days with a FREE GIFT just for you, so don’t miss out!